This kitchen was actually designed and installed in the home of one of the directors of Black Rok. 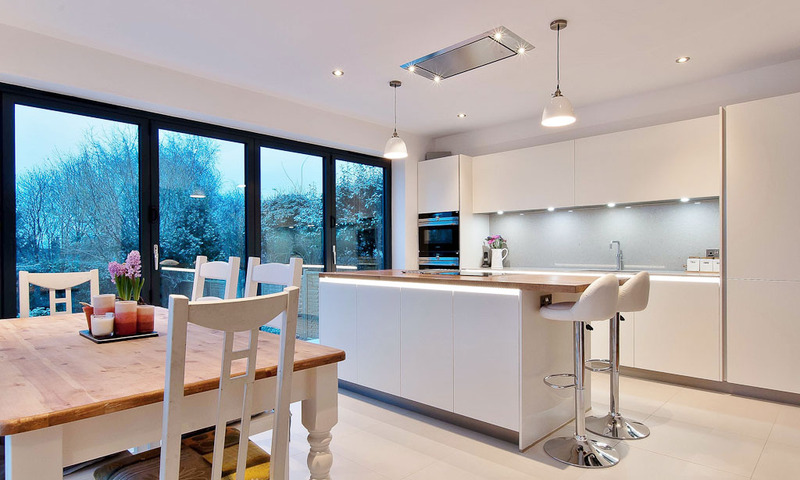 The idea was to build a single story extension on the back of the house to create a new kitchen dining room. The walls to the existing kitchen and hallway would then be opened up to enable a step down into the sunken kitchen, giving the kitchen a large, bright feel. 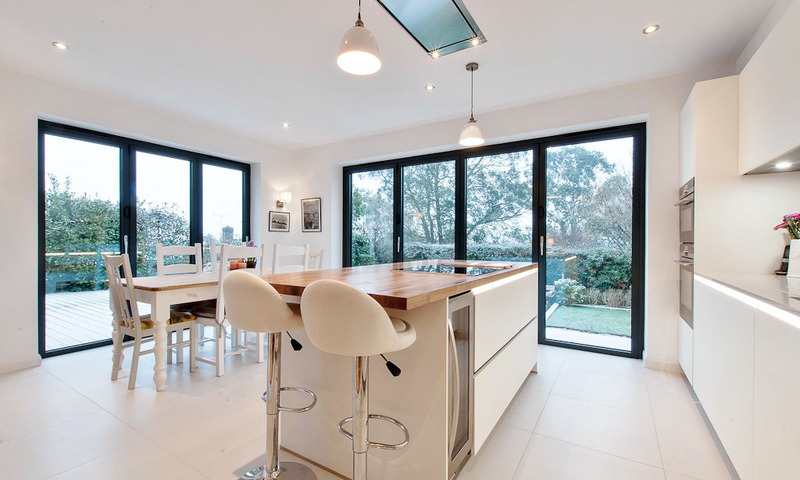 A spacious open plan kitchen was planned with bi fold doors bringing in lots of natural light. The original kitchen was to then become a playroom/snug for the young family to spend quality time together. 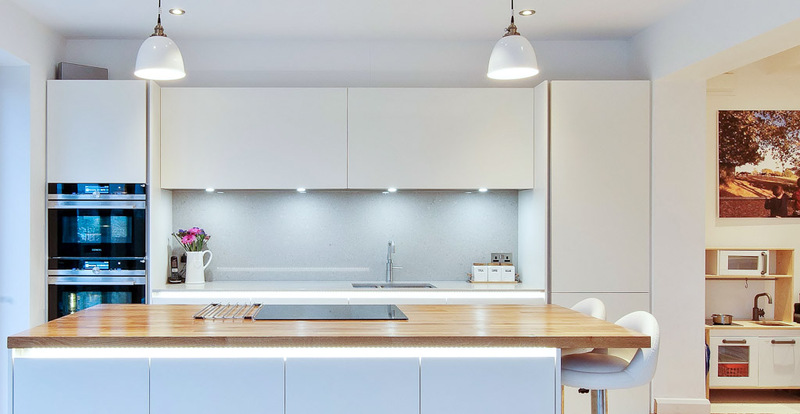 To start with the design focused on how to best utilise the new kitchen extension space to incorporate a spacious open plan room for the family. The new kitchen/dining room would have beautiful anthracite bi folds on two of the walls leading out onto decking, with the kitchen at one end and dining table at the other. 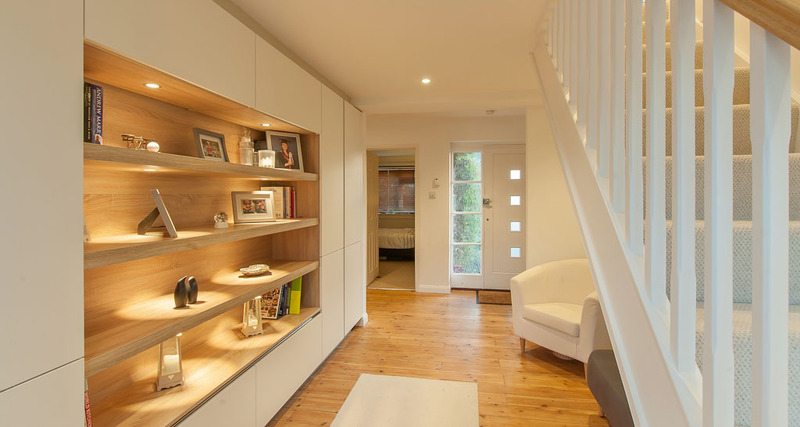 More space was created for this young family and allowed a more open plan feel to the house. To gain additional much needed storage, the spacious hallway housed a large bank of matching units and shelves, housing everything from kids boots to family photo’s. The flow was easy to achieve by grouping the appliances along the end wall with built-in ovens one end of the run and the full height fridge/freezer at the other end. In between, the dishwasher, bins, sink (complete with boiling tap) and storage drawers sit below the worktop. The kitchen is by no means large but the simple design coupled with super functional storage makes for a highly efficient space. The simple white, handless cabinetry is finished with grey quartz along the main run with Oak on the island to add a little warmth and texture. The hob is centred on the island creating a perfect space for cooking whilst being able to look at the beautiful garden. 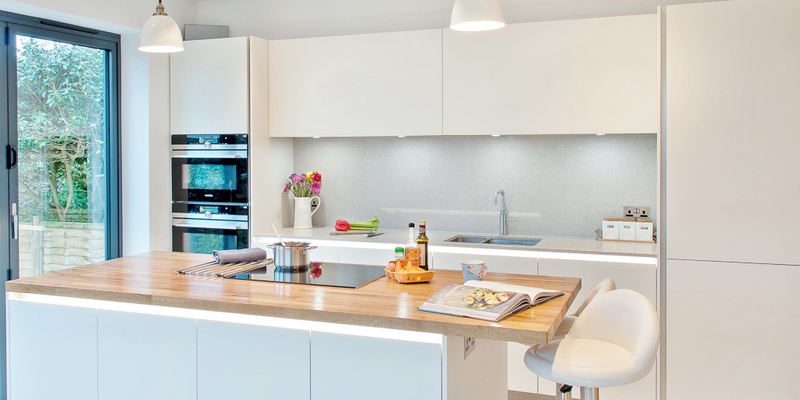 The end result is a stunning modern kitchen in a beautiful light and airy room with plenty of storage and space. With two young boys (both under 4years old!!) the kitchen is tested on a daily basis in terms of resilience, everything from spaghetti sauce to cars and diggers get thrown at it and after a quick wipe down it comes up as good as new. The lighting adds some drama along with the large glazing and whatever the time of day, it’s a wonderful place to be.